The 62-form Chen-style Taiji Single Sword retains the original essence of Chen-style Taiji single sword, by keeping down the elegance and unsophisticated style. This routine contents more than 20 methods of sword techniques, such as thrusting, uppercuting, pointing and so on. With the waist as the central axis of movement and the spiraling energy of "chan si jin" as its style. The requirements are: The sword techniques are exact, and the force is smooth. Practicing it is as gentle as drizzle, as powerful as a thunderbolt, as sensitive as a cat pouncing on rat, as steady as a bear walking on the grass. Stress the hardness or softness when revolving and moving, pay attention to the sword techniques, change force by body. 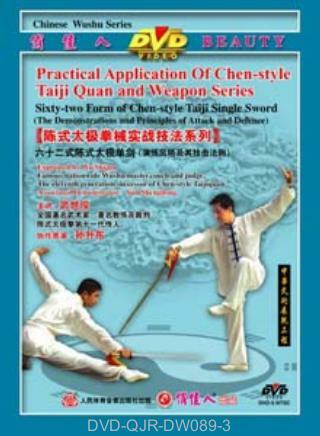 It is suitable for those with basic Wushu skills.